Tulasi (also spelled) Tulasi is called Holy Basil in English. It is a relative of the common basil used in western cooking. Unlike normal basil which is quite rajasic (stimulating / agitating) Tulasi is Sattvic (creating mental peace) and the ideal herb for spiritual practice. Tulasi is among the few plants on earth which is regarded as inherently sacred. The Tulasi plant is literally worshiped as a living Goddess in India by many thousands of Hindus. For worship it is said that no praanaa pratishthaa (consecration) rituals are necessary because Tulasi is already sacred by nature. Tulasi is considered especially sacred to Lord Vishnu, for whom Tulasi is said to be the consort incarnate. The leaves and flowers of Tulasi are offered to other forms of God in Puja and Yajnam, and the tea is taken by spiritual seekers to help in the cultivation of spiritual consciousness. It is used in all rituals of worship for Vishnu and his various form, but is held universally sacred to all sects of Hinduism. The plant itself has some very unique spiritual properties which effect the atmosphere around the plant. Spiritual practice done in the presence of this sacred plant is many times more fruitful, due to the plants ability to affect consciousness. Keeping a plant in the home is said to help remove negative energies while creating peaceful, spiritual energies. In many Hindu homes Tulasi plants are grown by the front entrance to help protect the home from negative influences. 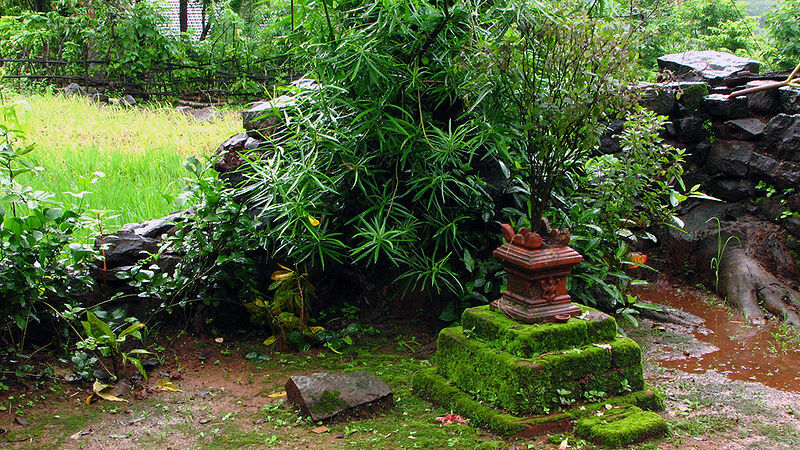 Swamiji teaches that every home should keep at least one Tulasi plant for use in prayer and healing. He says: "There is no fear of dis-ease in the house where Tulasi is kept and used with devotion as a spiritual sadhana." 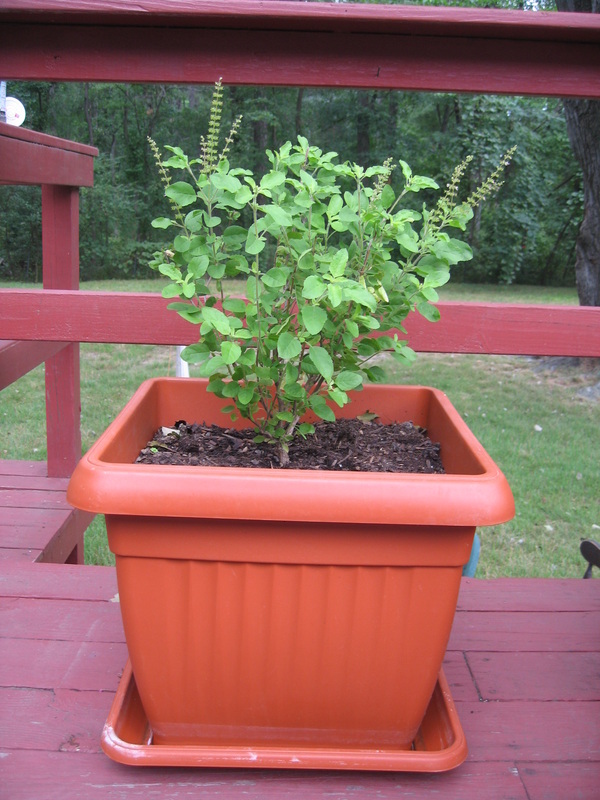 This Tulsi Plant is enshrined for worship in an altar-pot. Tulasi is a veritable medicine chest. There is hardly any condition which cannot be benefited through the proper use of Tulasi. In addition to effectively treating a large range of ailments, Tulasi is effective to prevent many diseases. It works on a physical level, clearing toxins from the body and strengthening immunity, but works also on a deep spiritual level helping people to release anxiety and repressed emotions. become aware of the unconscious tendencies which cause disease. The medicinal uses of Tulasi are being popularized in the West by Hindu spiritual teachers and Ayurvedic herbalists. Some studies have been done scientifically proving the ancient beliefs about the many healing properties of Tulasi and this is increasing the herb's popularity in the West. Tulasi has great nervine properties to calm and tonify the nervous system and the mind. It promotes mental peace and eases stress and worry. It can help to ease the pains of all sorts of nervous conditions, tremors, paralysis, Parkinson's, MS, sciatica, fibromialgia, and can assist in recovery after a stroke. 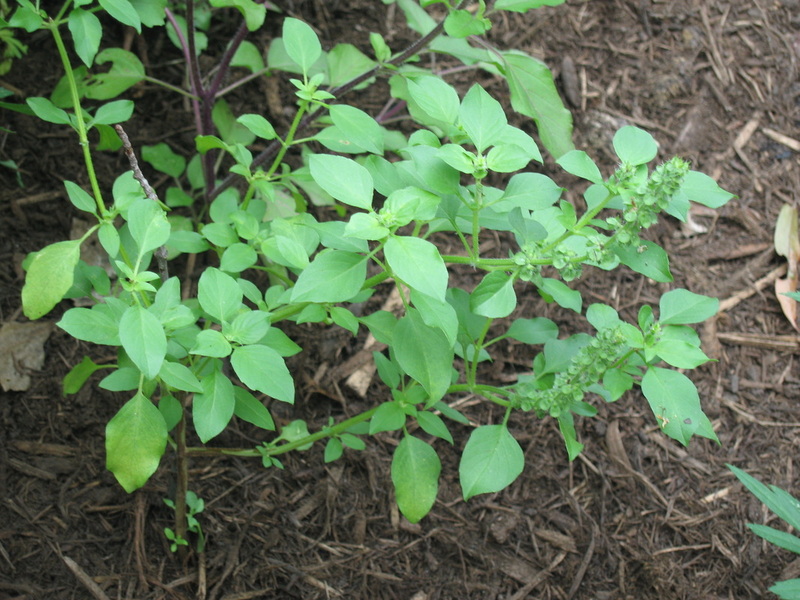 To treat mental illness or nervous conditions, Tulasi may be combined with nutmeg, brahmi, calamus, and ashwagandha. For nervous system disorders, it combines well with kulanjana, kushtha, cumin, ajawin, ushira, gokshura, and guggulu (1/2 part). 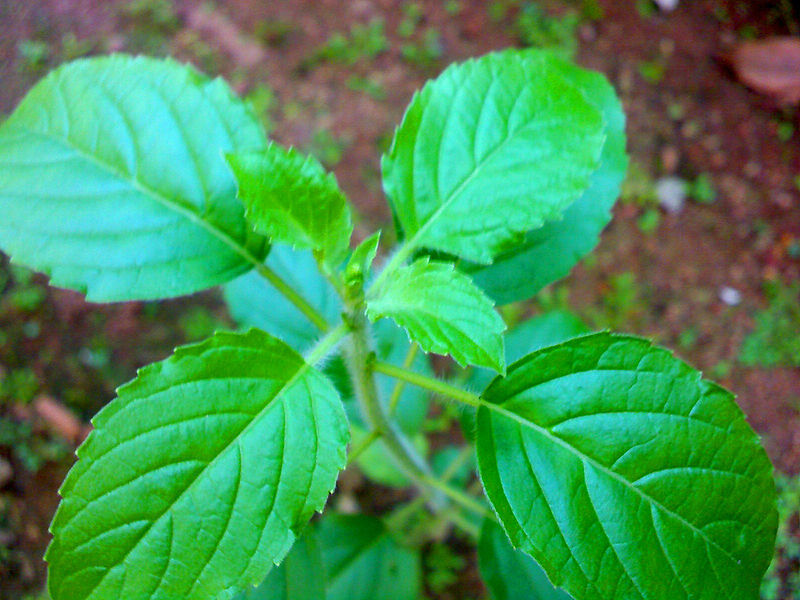 Alternately a tea of Tulasi may be taken with the traditional Ayurvedic formula "Yogaraj Guggulu." It is extremely useful for Yoga and meditation to produce the tranquility needed for spiritual realization to unfold. Tulasi is said to sharpen the intellect, increase memory, and promote clarity of thought and perception. It helps the mind to transcend normal states of consciousness and to attain the highest mental state of awareness (samadhi). For meditation Tulasi may be combined with brahmi, and lemon balm. For increasing intellect, memory and perception Tulasi may be combined with Gotu Kola, Jyotishmati, and Amalaki. Tulasi is expectorant and removes mucus from the lungs and sinuses. It helps to relieve cough and lung conditions like bronchitis. For congestion Tulasi may be combined with licorice, sitopala, pushkarmula, and pippali. It is very good for allergies and for the prevention of asthma. For allergies Tulasi may be taken with Amalaki, Ashwagandha, Brahmi, Calamus, and Pippali. Tulasi is good for sore throats. The tea may be drunk or used as a gargle. A good gargle for sore throats is made from one tsp of salt, 1/4 tsp of each turmeric, licorice, and tulasi steeped / dissolved in hot water. Tulasi is good for the breath in general and increases the flow of praana (breath / life force). This is usually only done through spiritual practice. As the prana deepens the vitality and mental capacity also increase. Tulasi helps in mantra and pranayama practices (both of which require much prana). It can also help when there are obstructions of prana and other energies in the body. For deepening the breath Tulasi may be taken with Brahmi, Somalata, Jassmine, and Shankhapushpi. For moving stagnant prana Tulasi combines well with fennel, coriander, cinamon, and guggulu (in 1/8th part). It stimulates healthy digestion (without overly aggravating pitta). For Pitta it increase absorption Tulasi may be used with Coriander, Fennel, and Cumin. To increase the digestive fire or to stimulate appetite, Tulasi may be combined with Ginger, Cardamom, and lemon juice: 3 Taulasi leaves may be taken on a thin slice of fresh ginger with a sprinkling of cardamom powder and lemon juice. For anxious indigestion, Tulasi may be taken with hing, black salt, nutmeg, ajawain, and black pepper. Tulasi can even be used to treat ulcers, due to its stress relieving qualities. Most ulcers are caused by pitta and vata and triggered by stress. Though ulcers are aggravated by many pungent herbs, Tulasi can help to reduce ulcers because it calms the mind and emotions. For these purposes it is best to combine Tulasi with Amalaki, Bhringaraj, Yashti Madhu, Shatavari, and Jatamamsi (or Nutmeg). Tulasi's expectorant effects make it a great herb for colds. Tulasi is a powerful diaphoretic (it stimulates perspiration) and can be useful to reduce fever. Regular use of Tulasi helps to prevent fevers, colds, and infections, but when they do occur, these conditions may also be treated with Tulasi. For colds Tulasi may be taken with Ginger, Pippali, Honey, and Lemon. For fevers, it combines well with Lemon grass, coriander, mint, and ginger. Unlike many other popular herbal teas which have strong diuretic properties which tax and deplete the kidneys through the excessive urination they cause, Tulasi is tonifying to the kidneys. It can be used to treat kidney stones. As a kidney tonic, Tulasi combines well with ashwagandha, gokshura, punarnava, and gudduci. For kidney stones Tulasi can be combined with pashana bedha, lemon grass, coriander, shilajit, and honey. Tulasi tea can be helpful to restore strength to the kidneys after intense stress, extended worry, travel, and too much salty foods (all of which weaken the kidneys according to Ayurveda). Teabags may be taken on Airplanes and steeped with hot water provided by flight attendants. To help reduce the stress of flying and depletion of the kidney. Tulasi helps to reduce the effects of stress and aging. It is considered a very powerful adaptogen. It helps people to face stressful situations with a calm disposition. Stress causes all systems of the body to break down more rapidly. Adaptogens help to reduce all kinds of health problems and the effects of aging by helping a person cope with stress. Tulasi is excellent in this regard because it works on a deep spiritual level which ensures the release of stress even from spiritual causes and past lives. As a general anti-stress, anti-aging, tonic formula. Tulasi may be taken with honey, amalaki, gudduchi, ashvagandha, shataavari, turmeric, and pippali. Or its tea may be taken with boiled milk and the traditional Ayurvedic formula "Chyavana prash." Tulasi is said to help regulate the Blood Pressure. For this purpose a Kantha Mala (a rosary for wearing) may be worn. Or a few leaves may be steeped along with one large (clean) Rudraksha bead overnight in room temperature water and taken each morning. These remedies will help to balance the blood pressure whether it is high or low. When the blood pressure is very high, Tulasi's hypotensive (BP reducing) properties may be enhanced by combining it with sarpagandha, brahmi, rose petals, arjuna, and gokshura. The Regular consumption of Tulasi helps to maintain the health function of the pancreas and to prevent diabetes. It helps the body to maintain a steady level of blood sugar and can be used in the treatment of low-blood sugar or high blood sugar. Of course, it should be noted that the surest prevention for diabetes is from reducing sugar levels and avoiding refined grains and sugars and artificial sweeteners. In general, no blood sugar problems will be effectively dealt with without some regulation of the diet. Hypoglycemia is often caused by an over active agni (digestion) which leads to quick release of sugar into the blood, which creates a sugar rush and excessive thought. This condition requires frequent meals. For its treatment Tulasi may be taken with brahmi, licorice, cardamom, and shatavari taken with milk. To prevent diabetes, tulasi may be taken each day in the morning with kerela (bitter melon) and methi seeds. To treat iondigestion caused from excess sugar consumption, Tulasi may be combined with cinnamon, methi seeds, and gurmar. For the treatment of diabetes, Tulasi combines well with gurmar, neem, turmeric, methi, cinnamon, gokshura, guggulu, amalaki, gudduchi, and shilajit. The regular consumption of Tulasi is believed to increase immunity. It helps to guard against all diseases. For this purpose one or more leaves of fresh Tulasi may be eaten fresh daily, or tea can be taken. For an immune tonic, to help ward off all dis-ease Tulasi can be combined with gudduchi, amalaki, gokshura, and pippali and taken with honey. Tulasi is a good herb for the mouth, gums, and teeth. It can be helpful to reduce bad breath and to treat receding gums. It is useful in the treatment of inflammation of the gums. It is a common ingredient in Ayurvedic tooth powders. For bad breath, tulasi may be combined with cardamom and / or cloves. For receding gums, tulasi powder can be mixed with sesame oil and messaged into the gums. For inflammation of the gums, tulasi can be combined with turmeric, amalaki, licorice, and ghhe and applied locally. A good Ayurvedic tooth powder (for brushing the teeth) can be made from equal parts of powdered Tulasi, amalaki, haritaki, bibhitaki, neem, saindav salt, and clove. Tulasi has been used in Ayurvedic skin-care preparations for many centuries. The Charaka Samhita recommends Tulasi for various skin diseases including itching, rashes, boils, and edema. Tulasi is especially effective to treat ringworm and other parasites that effect the skin. For the treatment of ringworm, the paste of the fresh leaves is combine with lemon juice. For other parasites that effect the skin like fleas Tulasi leaves may be cooked in mustard oil and strained. Then the oil is applied. Powdered Tulasi may be mixed with ushira, vidanga, nagakeshar, nirgundi, and turmeric and made into a paste with water. This paste may be applied to the body to treat parasitic skin conditions. The ash of Tulasi burnt with ghee and honey is extremely useful in the treatment of eczema. Small amounts of this ash may be mixed with fresh ghee and applied. Fresh Tulasi juice (pressed from the leaves)( may also be applied and taken internally. For wounds, tulasi powder can be mixed with alum powder. This stops bleeding and promotes quick healing. For bruises, Tulasi can be combined with turmeric, sandalwood, manjishtha, and shatavari. For burns and rashes the paste of fresh Tulasi leaves may be combined with aloe gel or coconut oil. For itching, fresh Tulasi leaves may be rubbed on the skin. For edema, 1/4 tsp each Tulasi, amalaki, and dasha mula may be eaten with 1 tsp castor oil. As a skin pack for revitalizing the skin, Tulasi can be mixed with licorice, amalaki, and sandalwood in equal part. Then chickpea flour is added in an amount 2 times that of the herbs. This skin pack may be applied after abhyanga (oil message) and then washed off. For a face pack, Tulasi combines well with, brahmi, amalaki, licorice, manjishtha, bilva fruit, ushira, and rose petal. These herbs can be mixed with enough yogurt to make a paste and then applied to the face to revitalize the skin and remove wrinkles. Tulasi is excellent for first-aid remedies because it is one of the Samjna Sthaapana (Consciousness Placing) herbs mentioned by Charaka. These herbs are said to reduce shock after traumatic injuries and even to restore consciousness. For reducing shock after accidents, it is useful to include Tulasi in first-aid remedies whenever possible. In addition, a shock relieving tea may be made from equal parts of Tulasi, Vacha, Brahmi, Shankhapushpi, Jatamamsi, and 1/4th part of hing. An Ayurvedic "smelling salts" may be made for restoring consciousness to an unconscious person by combining 3 parts camphor powder, 1 part each of Tulasi, Jatamamsi, and Guggulu, and then mixing this with freshly pressed onion juice. This remedy is especially effective if energized with mantras for reviving like the uttishtha brahmanaspate mantra or the mahamrityunjaya mantra. Tulsi leaves are placed in the mouth of dead bodies before cremation because they have the power to restore consciousness, raise the dead, or to help the soul of the deceased in the transit in the inner realms. For raising the dead, tulsi should be combined with other suitable herbs like camphor, turmeric, sandalwood, and calamus root. These herbs can be burnt to fumigate the body along with specific mantras for restoring life to the body, like the Vedic Sanjivana Suktam. Tulasi may be used as an effective anti-dote to poisons and toxins. It increases the digestion which helps process and remove poison from the body and it helps purify the blood of toxins. People should never rely on herbs as a home remedy for serious poisoning, but instead go immediately to the hospital. Even in Ayurvedic medicine, extreme therapies like Vamana (therapeutic vomiting), virecana (purgation) and even Rakta Moksha (blood letting) would be employed for serious poisoning. These therapies cannot be safely attempted at home by laypeople. For more minor poisoning like food poisoning, Tulasi may be used as an anti-dote. A tea may be made from tulasi, ginger, and Perilla fructens. This tea helps to increase digestion and to eliminate mild poisons. For more serious poisoning, after proper treatment has been received some residual toxins may remain in the system. These may be effectively purged from the body by taking a combination of Tulasi, nagakeshar, anantamula, amalaki, haritaki, bibhitaki, and calamus. For chronic poisoning, like that from accumulated toxic metal, or from allopathic medicines, narcotics, alcohol, tobacco, radiation, or environmental toxins, Tulasi is excellent for bodily purification. It works on a spiritual level and cleanses the physical and subtle bodies simultaneously. For such toxic accumulation Tulasi may be combined with ginger, haritaki, anatamula, brahmi, vacha, ashwagandha, and nirgundi. 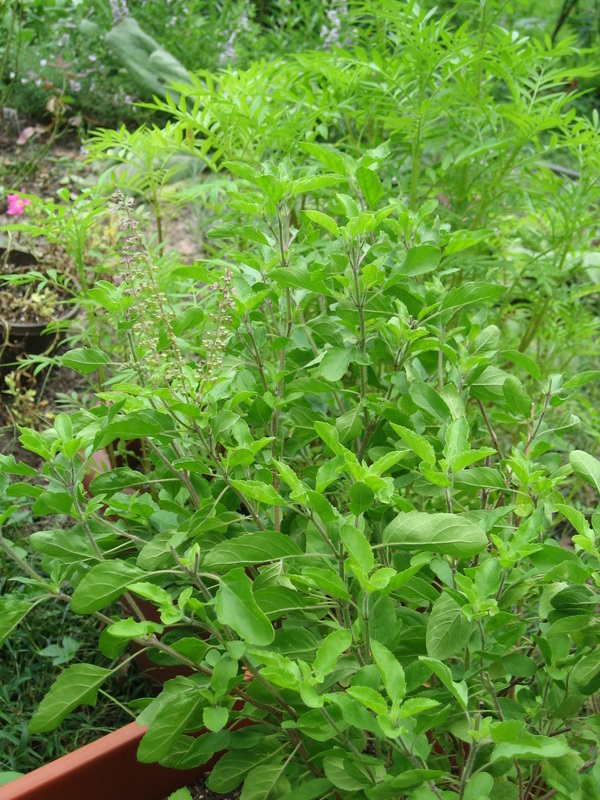 Tulasi is said to be an effective mosquito repellent. The essential oil is most potent and best for this purpose. A 1 oz bottle of sesame oil may be combined with 16 drops of neem oil, 6 drops of Tulasi oil and 12 drops of lemongrass oil. This oil can be applied to repel mosquitoes (it also serves as an effective sun-screen). This oil helps repel bugs, and can also be used to treat inflammation and itching from bites. To treat areas effected by fleas and other bugs, a strong decoction of Tulasi (prepared with mint, lemon peel, neem leaves, and methi seeds) may be sprinkled around the effected area. Or sprigs or stems of dried Tulasi may be burnt regularly with mint, guggulu, calamus, and neem. Tulasi can help to repel pests from the garden, for which purpose a small amount of Tulasi decoction may be added to commercial (or homemade) pest products to increase their efficacy. Tulasi may also be used in homemade fertilizers. Tulasi provides essential nutrients to growing plants while cleaning, strengthening, and protecting the aura of the plants. For poisonous insect, scorpion, or snake bites, tulasi may be used with other herbs like nagakeshar, anantamula, manjishtha, kapi kachu, and neem can help expel poison (while waiting for proper treatment). Drinking Tulasi tea is said to help reduce the harm of snakebites. For this purpose Tulasi combines well with brahmi, vacha, and nagakeshar. These four herbs may also be used along with neem to deter poisonous insects and animals. Tulasi may be also used to help deter other pests. Tulasi has several uses in the home, garden, and on pets. Like other species of basil (Ocimum genus) Tulasi is particularly good for repelling flies and mosquitoes. For these purposes the essential oil is most potent, however very strong "tea" may also be used. A few drops of oil diluted in water or a potent tea may be put into a spray bottle and used to mist the effected area. Tulasi is specific for fleas and mosquitoes, but it is beneficial to reduce all sorts of pests whether they are insects, fungus, birds or mammals. For this purpose it is best to combine Tulasi with other oils or herbs specific for that particular pest. Tulasi is good to reduce the likelihood of all pests, because of its spiritual energy. Pests are indicated in Vedic Astrology by the planets Rahu and Ketu. It is said that these plants attract pests and negative energies wherever there is clutter, dust, or dirt. Tulasi helps in the process of cleansing a space to protect from pests. Tulasi cleanes in ways that other substances cannot because it works on an energetic level. Tulasi is a great herb for healing spiritual disorders. It has a very sattvik (pure / sacred) quality to it which makes it good for dealing with all sorts of spiritual energies, and entities, black magic, and negative karma. Keeping a Tulasi plant in the home purifies the space and can remove negative energies from previous (or current) residents. It works on a subtle spiritual level as well, purifying the auras of the people who come in contact with it and protecting from demonic beings, black magic, and other negative energies. Tulasi's naturally occuring spiritual energies have been empowered by peoples' devotion over many centuries of worship in India. Tulasi's spiritual powers will be greatly enhanced if people have devotion to Her. Daily puja to Tualsi Devi is great for this purpose because it opens a channel to the inner planes for the Devas to empower the space and also increases the pujari's faith and devotion. Taken Tulasi internaly or burning it as an incense can further enhance its abilities to protect a person from all sorts of negative energies. Tulasi can be used to treat insanity (which often stems from spiritual causes), demonic and other forms of possession, black magic, and the effects of negative family and personal karmas from the past which open people to various forms of darkness. For internal consumption to helps with these spiritual concerns Tulasi may be taken powdered with the powders of Vacha, Brahmi, haritaki, turmeric, neem, rose petal, ashvagandha, and sarpagandha mixed with ghee. If these herbs are not available it is alright to use only Tulasi, Vacha, and Ashwagandha. For a purifying incense which is very powerful, whole, dry leaves of tulasi, neem, and brahmi may be burned on charcoal with guggulu, vacha, turmeric, amala, and a little hing. If these herbs are not available, Tulasi may be burnt with only neem and guggulu. Tulasi is good for the health of the eyes. Fresh drops of Tulasi (1 or 2 per eye) juice can be used for eye strain or night blindness. For redness and puffy eyes that accompany allergies, Tulasi can be mixed with ghee and applied into the eyes. For an all purpose eye wash a weak tea may be may from triphala, chamomile, and Tulasi. This tea should be strained through several layers of cheesecloth to ensure that no powders will get into the eyes. A little rose water can be added to the strained tea and used as an eye wash for all sorts of eye problems. Tulasi may also be added to fresh kajjal to improve eyesight. Powdered Tulasi, and amalaki should be mixed with water to make a thin paste. Organic cotton should be coated with this paste and then dried thoroughly. Then the cotton is fashioned into a wick and soaked in ghee or castor oil. The soaked wick is then placed in a small brass bowl of ghee and burned until the ghee is burnt off. The black ash is collected and then made fine by rubbing between the fingers. This ash is applied to the inner eyelids like eye-liner. This ash may be applied daily to cure eye conditions of all types. Taken internally Tulasi can be part of an effective eye tonic. Cook 1 lb diced carrots with a little fresh ginger (1-2 tsp), 1 tsp fresh tulasi leaves (or 1/2 tsp dry), 1/2 tsp mushta, and 1/4 tsp vacha, and a small handful of goji berries (Lycium barbarum). A little salt or sugar may be added to improve the flavor. This tonic may be eaten weekly for the maintenance of eye health (children should not eat too much of this, no more than 1/4 cup at a time). Tulasi is also very good for the ears. It can cure earaches and ear infections. Tulasi is helpful when there is ringing in the ears and dizziness. When there is any general sense of imbalance and the ears are affected, Tulasi is one of the best herbs. A powerful oil can be made for treating earaches and ear infections using tulasi, neem, garlic, bilva root, and vacha. 1 part of chopped fresh or dry herbs is cooked with 4 parts of sesame oil and 16 parts of water. The mixture is cooked slowly until all the water has evaporated, and then the mixture is strained and stored in a glass jar. It is important to watch the oil toward the end to avoid overcooking. If these herbs are not available, you may use just Tulasi, neem, and vacha, or only Tulasi. It is possible also to extract fresh juice from Tulasi leaves by pounding in a mortar and to use this juice in place of oil. Tulasi drops are also good for hearing loss. An oil may be made in the same way as above using Tulasi, garlic, ashwagandha, amla, dasha mula (10 parts), vacha, licorice, ushira, mushta, and nutmeg to treat all sorts of hearing loss. Even deafness can be cured with the regular use of Tulasi. For deafness the efficacy of this oil will be increased by drinking Tulasi tea and taking yogaraj guggulu with cow's urine for pitta and kapha and cow's ghee for vata. Drinking Tulasi tea regularly helps to reduce ear infection and hearing problems. Tulasi is excellent for the nose, throat, lungs, and sinuses. It can cure all types of congestion. For this purpose 1 TBS of tulasi may be boiled with, 1 TBS of mint, 1 tsp amla, and 1 tsp fresh ginger. After the water has begun to cool a few drops of eucalyptus oil or a tiny pinch of camphor powder may be added to the water. This water is poured into a large heat-proof bowel and used as a steam inhalation by placing a the head over the bowel and covering the head and bowel with a large towel. A simpler formula is tulasi and eucalyptus only. Tulasi is an important ingredient of many popular nasya oils (oils for uses as nose drops). A good tridoshic nasya oil which helps cure and protect against all nose, eye, and throat problems (and which can cure balding) can be made using Tulasi. 1 part of herbs is cooked with 2 parts sesame oil, 1 part coconut oil, and one part ghee, along with sixteen parts water as above (see ears). The herbs to use are 4 parts Tulasi, 2 parts bhringaraj, 1 part brahmi, 1 part tagar, 1 part vacha, 1 part yashti madhu, 3 parts triphala, 1/4 part ela, and 1/8 part tvak. A few drops of this oil may be used daily as a nasya oil for prevention of all sort of problems of the head and even stiffness of the neck. The incense or essential oil of Tulasi helps prevent diseases of the nose as does the smell of fresh plants. Tulasi helps to treat headaches caused by all three doshas. It is important to know which dosha has caused a headache to treat it effectively. Vata headaches are often extremely painful. They begin at the back or top of the head and the pain spreads and moves around. The best thing for vata headaches is rest. This headache is sometimes caused by dehydration and therefore its treatment should always include drink plenty of warm liquids. An herbal treatment for Vata headaches can be made by soaking 7 skinless almonds in a cup of boiling water for ten minutes along with 1/4th tsp each of Tulasi, cinnamon, jatamamsi, and tagar. For Vata type headaches, a regular diet is important along with plenty of rest. Pitta type headaches effect the temporal region. Migraine head are usually pitta type headaches. These headache are caused by excess heat and often a toxic liver is involved. In an acute situation, the headache may be treated by applying a paste made from Tulasi, and sandalwood mixed with a little rose water. A cup of cool water processed in a blender with 1/4th cup of fresh coriander leaves may be drunk for additional cooling effects. To help prevent migraines, a tea can be taken daily made by steeping herbs in cool water overnight. These herbs are Taulsi, brahmi, bhringaraj, fennel, mushta, gudduchi, amalaki, haritaki, bibhitaki, mint, coriander, and haridra. Spicy, salty, fried and otherwise heating foods should be avoided. Kapha headaches are usually somewhat dull and start in the sinus area. The sinus area may be tender, and sinus headaches are usually caused by kapha dosha. Kapha type headaches may be treated by applying a paste of tulasi, amlaki, and cinnamon to the sinus area (around the nose and above the eyebrows). Or a small amount of tulasi powder mixed with vacha powder (2 parts Tulasi 1part vacha) may be inhaled as a snuff. Additionally, the treatments for the nose may be used for prevention and treatment of acute kapha headaches. Exercise is an important part of treatment but should not be done immediately after nasal administration of herbs. Ayurveda teaches women to exercise great caution during pregnancy. Many herbs are contraindicated during pregnancy due to their power to increas vyana and apana vaya (the circulation and downward movements in the body) which may cause miscarriage. It is wise for pregnant women to avoid all herbs during pregnancy unless she knows that those herbs in particular are safe. Tulasi is one herb which is in normal doses considered absolutely safe for pregnancy. It is recommended for pregnant women to improve the health of the baby and to protect from negative astral influences which may otherwise harm the child. Tulasi may help to treat morning sickness. A small pinch of (untreated) peacock feather ash may be taken with a cup of tulasi tea, each day to treat morning sickness. (It should be noted that it is said the smell of burning peacock feathers may cause miscarriage, so pregnant women should have this medicine prepared by someone else. Tulasi may be taken after pregnancy as well. It can be used by a feeding new mother to treat her child's colic. It is not recomended that newborns, take Tulasi, but a nursing mother can give the herb to their child by taking it herself. Tulasi is a safe and effective remedy for children and the elderly. It can be used for the various conditions it is used for for middle-aged people. Many herbs are considered unsafe for children when their bodies are young and growing and the elderly when their bodies become weaker with age. This is not true for Tulasi which is proscribed in India to children above the age of two and for the elderly until the time of death and after. Fresh leaves of Tulasi are placed into the mouth of the recently deceased to help their soul to move on toward a spiritual realm. With small children the amount of Tulasi given to children should be less according to their weight. If a standard does of Tulasi is 1 tsp per day for adults, then the quantity should be proportionally less for children. If the weight of an average adult is 150 lb, then the quantity of herbs should be 1/3 for a 50 lb child, that is 1/3 tsp per day. This can be estimated, because Tulasi is a relatively safe herb to proscribe to all. A 30 lb child may take 1/4 tsp. An 75 lb child may take about 1/2 tsp. Elderly do not need to reduce the dosage, but may wish to, reduce it by a quarter of a tsp. For children, Tulasi is a good immune system tonic, it helps to develop strong intellect, and can reduce indigestion. It is good to protect children and babies from negative spiritual energies and entities, for which purpose the strong tea of Tulasi may be sprinkled around the crib of babies or the bedroom of older children (Whole plants may be kept growing in these places if there is sufficient light). For the elderly, Tulasi does all these and also helps reduce rheumatism, memory loss, and the effects of aging in general. Tulasi is also being used successfully to treat pets. For pets, Tulasi may help cure diabetes, radiation poison (from chemotherapy), colds, cough, flatulence, sprains, eye problems, constipation, ulcers, liver problems, pneumonia, rapid heart beat and other problems. Tulasi has been used by farmers and pet owners to treat their animals with very good effects. We know people who have treated their dogs and seen miraculous effects. For animals, Tulasi may be used in the same ways it is for people. The dosage must be less for animals. To approximate the appropriate dose for animals, the animals weight is divided by 150. The remaining fraction will indicate the appropriate percentage of a human dose to give the animal. For example, if we have a 30 lb dog, we may divide 30 by 150 to get 0.2. This is the amount of a full human dose to administer. If a human dose is 1 tsp, then the thirty lb dog should receive 2/10ths of this. A gram scale can make these measurements more precise. If 1 tsp of dry Tulasi equals about 0.7 gr. then 2/10ths of this would be 0.14 grams. Though all varieties of Tulasi share the same classification as sacred plants, there are four common varieties available in the West which each possess slightly different qualities. These are Rama Tulasi, Krishna Tulasi, Vana Tulasi, and Kapoora Tulasi. These are all different varieties of the same species Ocimum tenuiflorum except for Vana Tulasi which is classified botanically as Ocimum gratissimum. There is some confusion among herbalists about these plants and much conflicting information published. To try to help to dispel this confusion about Tulasi, we are providing this detailed description of these four plants. It is commonly believed that Rama Tulasi and Krishna Tulasi possess the most potent medicinal benefits. In reality, all varieties of Tulasi have different medicinal uses. This misinformation may come from the fact that the Rama and Krishna varieties are most commonly used in worship as their names suggest. While it is true that the long-time use of these varieties in worship would increase the sanctity of these varieties, all types of Tulasi are considered sacred and all possess equal but different healing properties. The descriptions of appearance and medicinal properties of each Tulasi variety listed bellow are given in relation to the other varieties. It is wise to read this information in the context of the general description of Tulasi given above. Though there are dozens of verieties counted in India, only these four widely available plants are mentioned here. Rama Tulasi is identified by its medium sized green leaves and white to light purplish flowers. It possesses a relatively strong aroma. It is named for Lord Rama the 7th Avatara of Lord Vishnu. This variety is used in the worship of Lord Rama and Vishnu in general. Krishna Tulasi is distinguished by its dark purplish leaves and flowers. The plants often start with green leaves appearing much like Rama Tulasi and darken as the plant matures. 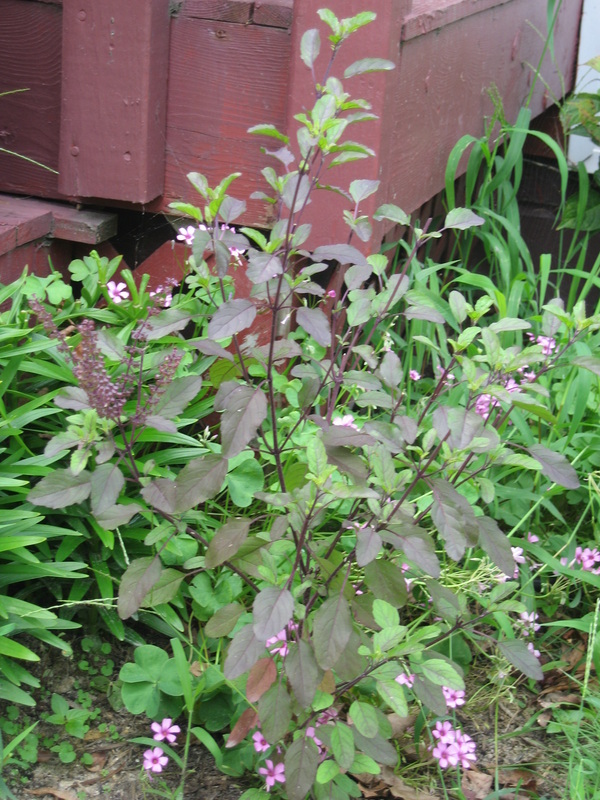 The purple color is most clearly noticeable on the upper leaves near the flowering tops and in the flowers themselves. Its fragrance is much like that of Rama Tulasi. Krishna means dark in Sanskrit and the name describes the dark coloration of the foliage. Krishna is also the name of the 8th Avatara of Lord Vishnu to whom this variety is held particularly sacred. The appearance of Vana Tulasi is the most distinct of all the four varieties of Tulasi mentioned here. This is explained by its different botanical classification (Ocimum gratissimum). The leaves of Vana Tulasi are usually somewhat smaller and lighter in color than those of other varieties. Its flowers are generally white in color. The plant possesses a distinctly lemony aroma. This variety is considered a wild variety because it grows wild through India and the lower Himalayan foothills. Kapoora Tulasi appears quite similar to Rama Tulasi with green leaves and whitish flowers. Its leaves are somewhat more serrated and its fragrance is stronger. Kapoora means camphor in Sanskrit, and as the name implies this plant possesses a somewhat camphory aroma.